And Jon Pertwee’s first story, Spearhead From Space, which falls just outside the range of the Project. We salute Mr. Martinus’ work and thank him for the hours of enjoyment he gave Doctor Who fans. Rest in peace, sir. Hello all, the Historian here. Yes, I know this isn’t the post you might have been expecting (I’ll catch up soon! I promise! ), but I wanted to note the sad passing of actor Roy Skelton, one of the not-sung-enough heroes of Doctor Who. He was the voice of the Daleks from 1967 until 1988 as well as voicing the Cybermen and multitudes of other creatures and appearing on-screen in the Third Doctor’s final adventure, “Planet of the Spiders.” As an odd coincidence, the TARDIS Project will be watching Skelton’s first work for the show this week (and I will hopefully catch up on things and blog about it by next week). RIP Mr. Skelton. Thanks for making so many monsters as scary and believable as they can be. The Historian here. One of the biggest stars of Doctor Who you’ve probably never heard of, John Scott Martin passed away this January 6th. He probably appeared in more episodes of the show than any other actor, mainly playing various monster roles. 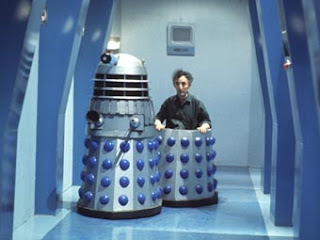 He was most famous as a Dalek operator–indeed, it is fitting that we remember him at the same time the TARDIS Project is in the process of covering his first appearance on the show during the original Dalek serial. And so, we raise our flagons high to John Scott Martin, 1926-2009–the greatest Exterminator of them all! The image is that of Mr. Martin “exposed” behind the scenes of the season four story “Power of the Daleks,” which we will get to! Eventually!